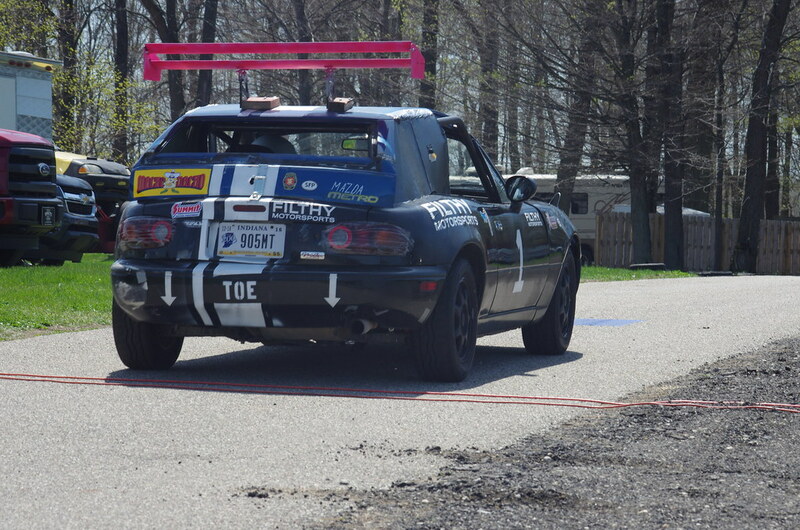 Our car, the Petrosexual Trashback Miata / Mazda Metro just finished its 5th race at Gingerman a couple weeks ago. It was the first race that we've made it all the way through with no break downs, no incidents on the track, and no black flags and we ended up in 18th overall. We also got the first ever "Seriously, WTF" trophy for the bribe that got us into B class (still only finished 8th in B). The car is a '94 miata that had been crashed (legit sub $500 car). We cut the top off of a geo metro and welded it to the roof, then cut up an old trash compactor for the sheet metal sides (hence the trashback name). Judge Eric called it the "Epitome of Miata Sadness". So now that we seem to have the car dialed in and reliable, we naturally have this overpowering urge to do something stupid, which is where this "almost free" V8 swap comes in. 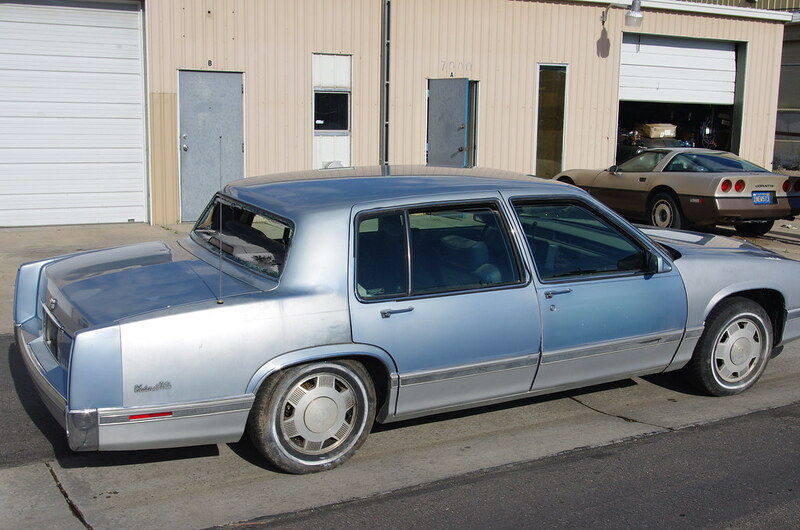 It turns out, some V8's can be had for free in a running car, which is the case with this 1991 cadillac with a 4.9 "High Technology Engine" that I found on craigslist. Its a FWD V8 that most people seem to dyno around 170hp and under 250 lb-ft at the wheels stock and has basically zero aftermarket support. But, it seems like some teams have had decent reliability with them at Lemons races. For the transmission, it turns out that a 1998 Dodge Dakota 2wd with the 2.5L 4 cylinder has a transmission and bellhousing that will mate up perfectly to the 4.9 GM Metric pattern. The local scrapyard charges $99 for a transmission with bellhousing. The plan is also to swap the diff to an IRS Ford Thunderbird 8.8, which can be had for $59 at the scrap yard. It will require new cv axles, but its a common enough swap that aftermarket custom axles are actually as cheap as miata axles. The running stock drivetrain from the miata can all be sold, and this swap can be done for FAR less than what we'll get out of those parts. Our team has tons of fabrication experience, so this can and will definitely happen. The question is, how many laps until something goes wrong? Any bets? Will the judges like it or give us penalty laps? Just bring a 55 gallon drum of loose spaghetti 'o's and I bet you'll get C class with zero laps! In the 80's I had a Limo service. I eventually sold all the Caddys even though they made a much better looking Limo than the Lincoln. One of the (many) problems was the HT4100 engine. They came in two flavors. 1. Engine develops a big end bearing knock at idle/low rpm around 30k miles but keeps knocking away till 130k miles when it blows up. 2. Engine is silent as can be until 60k miles at which point without any warning at all spits the rods out the side and crank on the ground. I'm sure you'll be fine. So you're telling me there's a chance for success?? Which of those two options is success? The answer is of course, highly unlikely but always a chance. never tell him the odds! Oh yeah, I wouldn't sweat it. If this swap doesn't get you into Class C I'll eat Eric Rood's hat, or at least eat Spaghetti-Os from it! Racing the "Toylet" Toyota Celica powered by Chevrolet Ecotec. The tale of the Dodge gearbox bolting right up to the Cad V8 was an eye-opener. I find that absurd! What will you use for a flywheel? Judges Choice and Regional Award winner! Chuckwalla '12, Buttonwillow '13, BFE GP '15, Miller '14 & '15, Sonoma '13,'14,'15,'17, '18. Inde '16,'17,'18. 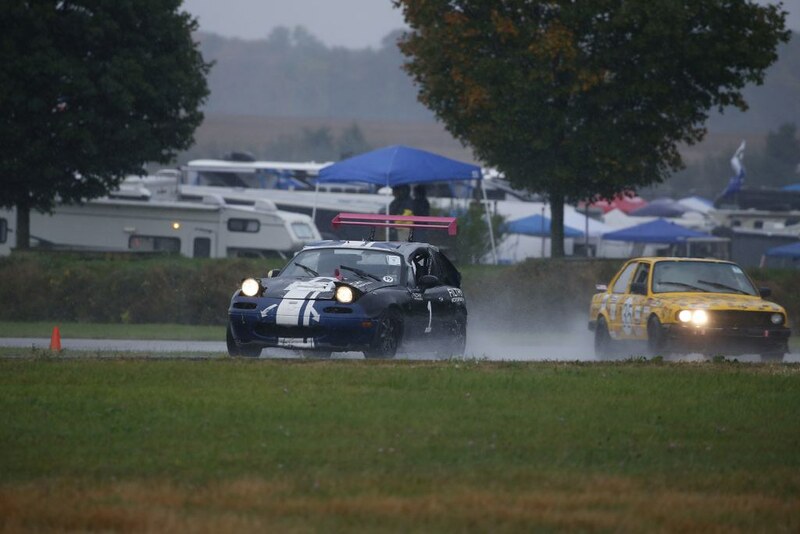 Other foolishness: Finisher of the inaugural Lemons Rally, in the black Jag.... and IOE in the Super Snipe back in '12. The story goes that AMC/Jeep used the GM 2.8 V6 (which came with the GM metric bellhousing pattern) for several vehicles in the 80's. They then used that same pattern for their smaller 2.5L 4 cylinder so they could continue to use the same transmission setup. In 1998, the revised 2.5L 4 cylinder that went into the new Dakota came with the AX15 5-speed manual and had the same GM metric pattern still. Most if not all were 2WD, so its perfect for this swap. The Ax15 built by Aisin is the same transmission used in the old Turbo Supra (R154), the 90's V6 Tacoma (R150f), mid-2000's GM (MA5), and was used behind a few Isuzu SUV's as well (AR5). I've run one in my turbo supra motor powered '85 toyota pickup for a few years now and never had an issue, so hopefully it will hold up well. For the flywheel, Fiero dudes have been running clutch setups on the 4.9 swaps for years. Some people plug and re-drill Cavalier flywheels, and some companies make conversion flywheels. We'll see what happens when the time comes. Its kind of a safety item, so a conversion flywheel might happen. It's amazing what transmissions will bolt to what. I too went down the rabbit hole that led me to learn that the MA5/AR5, R154, and AX15 all share a bellhousing pattern. You'd be amazed what a 2008 Solstice trans will bolt right up to. unrelated, anyone want to buy a 2wd AX15 sans bellhousing? Came from a dodge dakota. Also 120% not related, I have a 2008 solstice bellhousing I don't need either. Presumably you have a 1.8 diff since you can finish a race. Since you'll be running 3/4/5th gears, and making the same torque as a turbo Miata, you can probably use the stock diff, at least for a while. Might save you some time and effort. Just don't get on it in 1st or 2nd gear and the diff won't see much torque. If you choose to ignore this guidance, I have an aluminum 8.8 and some Factory Five narrow axles you may want. Lemons took all my time away from building my Audi V8 swapped Miata so I don't need 'em. 55 gallon drum is too much like a can. Now one of those soft bag dumpster thingys. The swap sounds cool. Any estimates on the gallons per hour you burn with the 1.8L? How about with the V8? The engine swap sounds cheap (except for the time). Do you have a big fuel cell? I like that first picture. LemonAid - Changing kids lives one lap at a time. I considered running the stock 1.8, but 4.10's are way too much for this motor/trans combo. I'm thinking the 3.27 ratio that the 8.8's were available with is much closer to what I'd like to run. That, and the 1.8 diff with torsen is worth some cash, so it seems more logical to upgrade to something more stout for not much more than re-gearing the miata diff would cost, and probably come out ahead with selling the miata diff. What's the diff from? T-bird/mustang/etc or the Explorer? What ratio? Does it have the limited slip? Let's talk. I think we were around 4 gallons per hour with the 1.8, maybe more with the fastest driver. V8 will be more than that, probably a lot more... Fuel cell will be within the 24 gallon limit. But really, you have to measure in smiles per gallon, which will be higher with the V8. We burn about 10 gph with a 460 cubic inch engine. In your godless commie metrified units, that's something like 7.5 liters. The 4.9 shouldn't burn much more than 6 or 7 gph. What do you want for the Solstice bellhousing? I use Chevy Colorado transmissions with solstice bell housing to connect to my LE5 Ecotec mostly because Colorado transmissions don't have sports car tax applied. Pay shipping? Shoot me an email and we can work it out. Right now it's just sitting in my garage taking up space. I have a 4.9 that I pulled out of my 1993 STS back in the day. You can have it if you want it for a spare. It had about 120000 miles on it. I can haul it to Gingerman next year...we will carry it under our giant umbrella(canopy). Was just poking around on engine specs for those and wondering about weight differences when I noticed that the HT Series had aluminum blocks and iron heads. Is...Is that a thing? Why wouldn't they just use aluminum heads, too? Yes, this is Malaise Era GM so the reason is generally "they saved a small amount of money." That said, is there any inherent engineering advantage to this? This is all a roundabout way of saying "This is a fantastic swap idea and I'm excited to see Lemons' first V8 Miata done the right wrong way. Yea, no idea why they put iron heads on it. I'm sure saving money had something to do with it. The interesting thing is, headgasket failures are actually pretty rare on these motors for some reason. The block with its seperate iron cylinder sleeves doesn't look all that stout or like a great idea, but we'll see how it does. Weight wise, it will probably be under 150lbs more than the miata motor/trans setup, from my calculations.